I left my hotel at about 7:20 and found a coffee shop in the next town. They had fresh pastries from a local bakery, so I bought a triple latte and two donuts and headed for Death Valley National Park. I wasn’t prepared for the beauty of Death Valley. I thought it would be flat with nothing but sand, sage brush, and cacti. I followed instructions and was surprised that the heat was not too bad. As they say, it was a dry heat. (Huey, a friend and colleague, often says, “It’s hot in Arkansas, but it’s a wet heat.” I prefer the dry heat.) After a climb to about 5,000 feet, the road dropped into a larger valley, also at sea level. This, I believe, is the real Death Valley, the 20-mule-team Death Valley, pure desert for about 10 miles. The only animal I saw was a chipmunk (I think) that ran half way into the road, saw my car, turned around, and ran back. I thinnk I would have gone ahead and crossed the road at that point. In the distance, I could see another mountain range, behind a heat mist. The heat flattened the mountains into light blue and grey silhouettes, one behind another, seemingly creating distance between each range. As I began to climb again and grew closer, I could see details in each mountain. Most had strata that formed when that piece of earth was flat on a sea bed. As the plates moved, pushing the rock up, the strata moved to the diagonal. As I drove through the park, I was amazed at the variety of rocks. 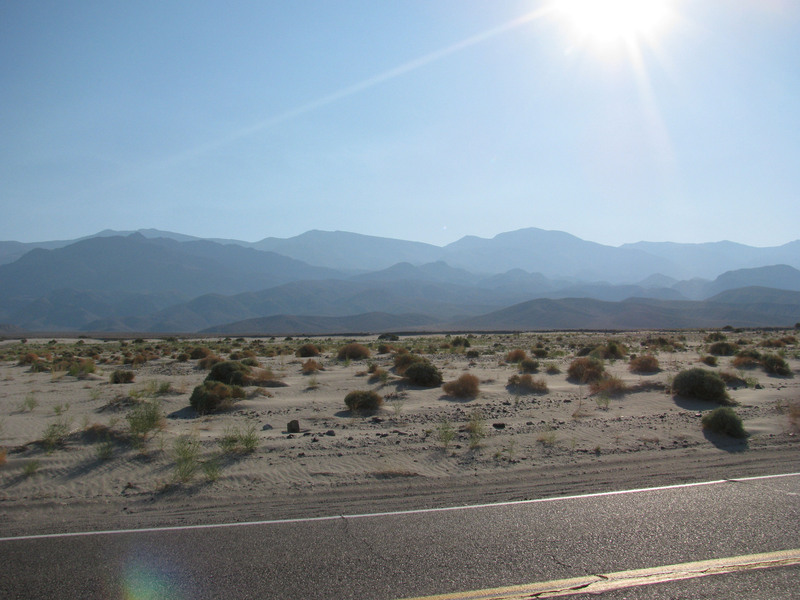 A geologist could probably spend an entire career studying a few hundred square yards of Death Valley. It is a place of stark beauty. In that sense, not worthy of the name Death Valley, but it must have been a dangerous place for pioneers. The heat, the scarcity of water, the difficult of climbing out of the valley once you’re in it, all this must have made deadly.